I know someone who offers free advice to people but lately, nobody has asked for any. What do you think would be a good way to drum up interest in said endeavor? Ole’ Fats needs to look at his calendar to find out the last time someone asked his Enlightenedness for some wisdom. Hmm, no, that’s a zodiac calendar. Let’s see… no, this one is a gardening calendar to let me know when I should plant my goat-munching fly-traps. Seriously, goats keep eating my venus-fly traps, so I’m planting – well, installing really – large metal spring-loaded contraptions to get those damn things. Anyway, not that calendar. I need the… what the… this is the Mayan Calendar. Why do I even have one of those? No matter, it’s been a while. And that can only mean one thing – that Fats is irrelevant. That in my boundless wisdom, I have helped every single person that needs helping. So brightbelt yellsalot (any relation to Burgundysuspenders Yellsalot from Salem?) I can only assume that you were being vague for a reason: you didn’t want me to know that you’re secretly a reader of that imbecilic Portley’s Ill-Devised Suggestion Column. Why anyone would read the tripe of that talentless hack is beyond me but, hey, don’t blame me because you got bad taste. Seriously, that guy couldn’t dish out questionable quotations if his lips were on fire and his hands were melting. I mean that in total sincerity – I highly doubt he could talk or type in such a situation. I’ll be the bigger man and pretend that I’m somehow in that situation. I’ll overlook your audacity at even asking a question like that. I’ll even overlook that you for some reason don’t capitalize your own name; Freud would have a field day with your obvious inferiority complex. Hell, while I’m overlooking things, I’m totally going to overlook France. 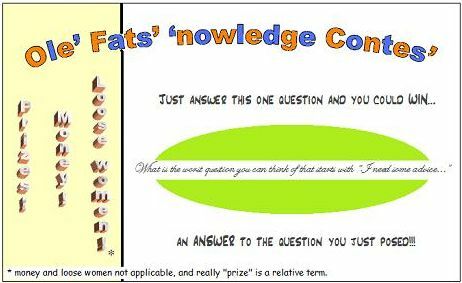 Okay, I’m in that situation – ole’ Fats somehow finds himself bereft of queries for advice for, say, the last 486 days. How would I respond? Great question that I have, for reasons that have nothing to do with my own situation, asked myself quite a bit. The first essential key is to have a good product. Clearly, in terms of what I do, no one does it better. I’ve heard a lot of ninnies say the same thing about them, but trust me, I can do what they do better than they can. And at dishing out Fats’ Bad Advice, nobody is better than ole’ Fats. So we don’t need to worry about the product. Why are you looking at me like that, Tendrils? Go back to your needlepoint and clam up. See, it looks just like a business card, giving you the valuable integrity you’ll need to attract your biggest target: people who like things displayed in business-card shaped format. This is particularly good if you can get sponsored by the apostrophe. You can use all those social outlets out there, like MySpace and Kazaa. Get the word out. You will be swimming in questions in no time. Or, if you’re on the east coast right now, you might just be swimming. But let’s say that contests aren’t your bag. The next suggestion is to be more persuasive. Simply suggesting that someone ask for help may not be direct enough. In this case, blackmail. Start to kidnap people, preferably people who have friends. The great part about this? Most kidnappings happen to families with money – here, you don’t have to worry about scouring the internets for famously wealthy people. In fact, often the destitute targets are the ones to aim for; family/friends of the recently kidnapped and poor will be thrilled when they discovery that you are not demanding money for the safe return of their loved ones, simply questions. Most of the time ransom is beyond the capabilities of the distraught, and that’s why police get involved. Well, EVERYONE can afford a question or two. They’ll have their next of kin back in time for Home Improvement, you’ve got yourself some more ammunition for your website, and best of all there will be absolutely no (though potentially much) police involvement. Listen to how your god responds. If he responds with, “Rectify? I barely know ‘er!” then you’re definitely a follower of GOKO. However, if he/she/it/they reply with a helpful answer, please write that answer down and send it here. I’ll… uh, relay it to… someone who needs to know. Nobody in particular. Just, you know, a guy I know. Thanks yellsalot (any relation to Marv Beekler of Memphis?) I’m glad I have crossed one of the last remaining of the unhelped off my list. For any of you that are left, though I’m sure it can’t be many at this point, send your questions here, and Fats will make sure to answer them with rapidity. (Who’s he?) Be quiet, GOKO.